A beautiful second floor two bedroom apartment which consists of a master bedroom with a king size bed, one twin bedded room, kitchen, bathroom, dining room and lounge. It is located at Campoamor and is superbly equipped to an extremely high standard with everything you need for a very enjoyable holiday. There is a very pleasant balcony off the lounge with lovely views of the area and the sea. The property also benefits from satellite TV with English, Spanish, Irish, Swedish, Norwegian, Danish & Finnish channels along with air conditioning in all rooms. 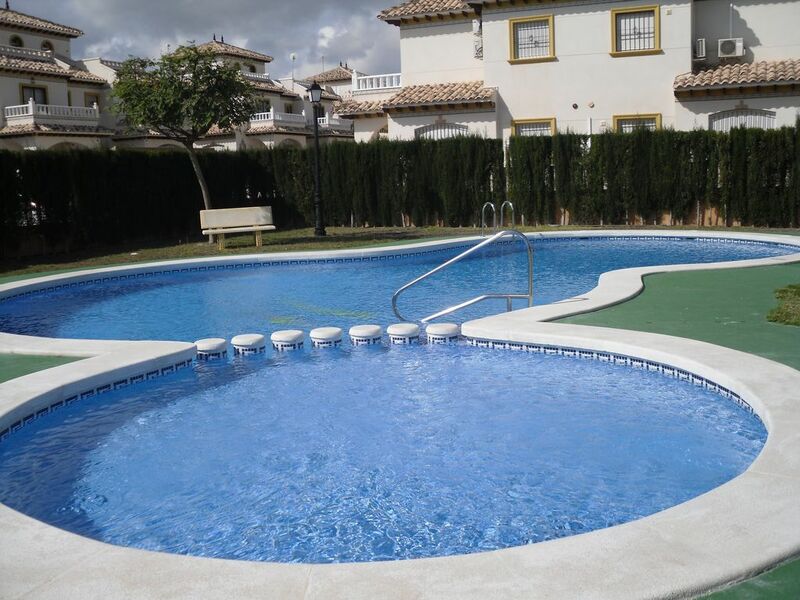 Internet access is also available if required, and the apartment is only 25 metres from the communal pool. The apartment is equipped with parasols, chairs, loungers, picnic box etc. all available for your use. There are many excellent beaches in the area; in particular the beaches at Cabo Roig and La Zenia, also the beaches on the Mar Menor are very calm and safe for children as it is protected by the La Manga strip. A lot of the beaches have recently been linked together by a very picturesque coastal walkway. There are many high quality golf courses in the area, the closest being Campoamor and Las Ramblas which are only 5 minutes away, bookings for all golf courses can be made through the Golf Factory which is also only 5 minutes away. The area is served by numerous bars and restaurants, several of which are within easy walking distance. The plaza at Villamartin (just 5 minutes away) or the strip towards La Zenia (just 10 minutes away) offer a huge number of bars and restaurants to suit all tastes. There are markets on every day of the week to enable you to bag a bargain, and a lovely craft market at night on the seafront at Torrevieja which has a lovely promenade to walk along. Torrevieja also boasts a marina, fairground, water park, shopping malls, a hypermarket and much more. There is also a new shopping centre called La Zenia Boulevard just a 5 minute drive away. Internet access is available if required. There are several very good local golf courses. Our apartment if very well equipped and spotlessly clean. The complex it is situated on is very quiet which serves for a very relaxing holiday, but within easy reach of all amenities you require. Had a lovely 6 days stay in the apartment. It was very very clean, the beds were comfy I slept really well. I would deffiantly recommend the apartment. The owner always answered any queries I had, and i had plently before we went. The management people were great and so helpful. We didn't know we're the apartment was so he went out of his way to meet us at Aldi car park, we went to the wrong Aldi so he came to us. Thank you so much Paul for what you did. Thank you Lorraine for your lovely review. We are very lucky to have Liz and Paul looking after our apartment! You are welcome back any time. Very clean and well equipped. Nice pool. Location a bit far out but was ok for us as we had a car. Many thanks for the review, your comments are greatly appreciated. We stayed in the apartment in January 2017 and we had a great time. The apartment has everything you need and is within walking distance of all the local amenities, bars restaurants and Aldi super market. The owners are very accommodating and we are looking forward to our next stay. Many thanks for the review which is greatly appreciated. We had a great stay at the property and in the area. The place has all you need (and more) and it is conveniently located within a close proximity to a supermarket and pub. Owners are very trustworthy and reliable. We hope to be back soon and will definitely recommend the accommodation. Big thanks to Liz and Paul for your hospitality and all the useful info you've provided us with! This 2-bedroom apartment is well-located, clean and well-furnished and the owners are very helpful. They are very thoughtful and have anticipated a traveler's every need from a well-equipped kitchen to iron board to garbage bags to beach chairs/towels to travel brochures and even a sewing kit if you need one! The area itself is quiet and close to beaches, restaurants and golf courses, all within a short 5 mins drive by car (which, incidentally, you would need to get around). The local grocery store (Aldi's) is just a 5 min walk. The apartment complex has a communal pool which is min's walk away! Overall, an excellent place to stay and explore the Costa Blanca. I highly recommend! Thank you for taking the time to write such great comments! We do try make the apartment a home from home and are so pleased you enjoyed your stay. You would be welcome back any time. We have used this apartment several times now. It is exceptional, the furniture and decor are top class, it is very roomy and very up to date, it is all very clean,comfortable and well maintained and there is such attention to detail. This apartment is definitely not your average holiday apartment rental. The owners go out of their way to make your holiday enjoyable and supply such things as beach chairs, umbrellas etc etc. There is a beautiful pool area which is very quiet. The area is lovely too and very peaceful and there is so much to see and do. There are many many beautiful beaches in the area, the Mar Menor is a must see, our favourite beach is La Zenia, the food in the beach restaurant is to die for. There are also lots of eating establishments right on your doorstep and a meal at Eduardos La Finca is definitely a must, the Sunday Lunch is wonderful. And, of course, the apartment is surrounded by plenty of beautiful golf courses, they all have lovely restaurants and bar areas, so even if you don't play golf, they are well worth a visit. We have already used the apartment once this year and are looking to go again later on in early Autumn. I would not hesitate to recommend this apartment to anyone. It is such an easy drive from Alicante Airport and an even easier one from Murcia Airport. Highly recommended!!! The area is served by numerous bars and restaurants, several of which are within easy walking distance. The plaza at Villamartin (just 5 minutes away) or the strip towards La Zenia (just 10 minutes away) offer a huge number of bars and restaurants to suit all tastes, and there are several beaches within the area. Golf: This area has at least 12 very high quality golf courses within 30 minutes drive of our apartment, and the La Manga Golf and Country Club within a 45 minute drive. The apartment has satellite TV with English, Spanish, Irish, Swedish, Norwegian, Danish & Finnish Channels . All our rates are fully inclusive, there are no additional charges for utilities, cleaning etc.